Today was somewhat of a laid back day. Our community contact came to see us this morning and we were able to pick up all of our camp supplies from the education office. We have a box of XO laptops, a duffle bag full of craft supplies, and three boxes full of books. Our living room floor is currently a disaster, but it has been fun sorting through all of the books and brainstorming ideas for how to use our craft supplies. The boxes of books even included a copy of The Artist by John Bianchi, which was one of my favourite books as a child, so that definitely made me smile! We were also finally successful in making a trip to the Northern Store. Not everything was as over-priced as I had been told to expect, but prices were certainly higher overall than what I am used to. After we dropped off our groceries (a lady was kind enough to offer us a ride when she saw us struggling to carry all of our groceries in the heat – everyone here has been very friendly to us so far), we decorated a birthday card for the daughter of the nurse that we met yesterday. She was having a birthday party and invited us along. We figured it would be a good chance to get to know some of the kids in the community (and give us something to do other than sit in our overheated house all afternoon). We were somewhat apprehensive about showing up at a birthday party for a child that we barely knew, but the kids there could not have cared less that they had never met us before. They just seemed excited that we wanted to play with them. Two of the little girls even asked us to walk them home after the party and they kept us entertained stopping to look at tadpoles along the way! The rest of the day was spent napping, playing bananagrams, and making lists of the different things that we will need to do over the next few days before camp registration begins. There is a lot to do, but the heat made it difficult to accomplish much today. Even though we have great access to internet, I have made a conscious decision to keep my phone turned off during the day when I do not need to be using it. I also do not plan on posting daily updates for the rest of the summer (that would most definitely bore anyone who happens to be reading this). I want to spend as much time as I can fully engaged in this experience, since I know that the time will really start to fly by once camp starts. That being said, I obviously want to spend some time reflecting and writing along the way. This entry was posted in Fort Albany and tagged First Nations, Fort Albany, Frontier College, Lieutenant Governor's Aboriginal Summer Reading Camp, Northern Ontario on June 28, 2014 by nicoledalessandro. I am officially on the ground in Fort Albany! 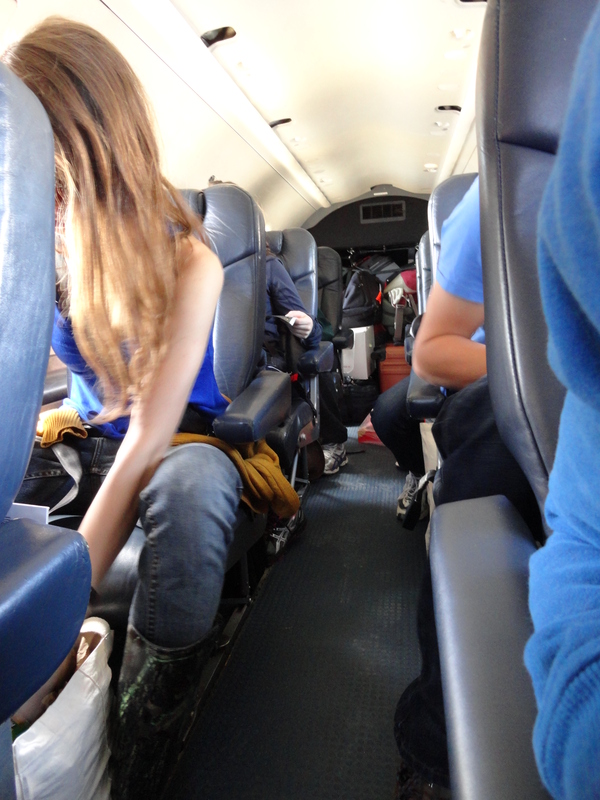 We packed up and left Lakehead at around 10am this morning, even though our flight did not leave until 2:00pm. They put us on a bus to the airport along with a team who was flying out at 12:15pm, which actually made out check-in and boarding less stressful since we were not in much of a rush. The lovely folks at Wasaya airlines also let us all through despite the fact that most of our luggage exceeded the 35 pounds each that we had been told was the maximum. After playing some arcade games, taking a lengthy nap, and stocking up on doughnuts to bring with us (one of the other teams suggested that it might be a nice gesture for those people picking us up at the airport), our flight was called and we made our way onto the tarmac to load into a small eight-seater airplane. Luckily, we were the first team to be dropped off and the flight to Fort Albany took just under two hours. The view from the plane throughout the entire trip was absolutely stunning. There is something completely breathtaking about looking down from the air and seeing nothing but untouched land and water. It certainly has a wonderful way of putting things in perspective. We were greeted at the airport by the Maintenance Supervisor from the school. He helped us load our things into his pick-up truck while we tried to cope with the massive number of bugs that were now swarming around us. He gave us a quick tour around town before dropping us off at the house where we will be staying. It is a teacherage located directly across from the school, which is quite nice since that is where we will be running camp for the summer. It has two bedrooms, a bathroom, living room, kitchen, and dining area – very comfortable accommodations for our seven-week stay here. The power was out when we arrived (it was extremely hot this afternoon) so we dropped off our things and decided to make a trip around the community with our doughnuts to see who we could find. We had very little success. The Band Council Office was closed, but we did cross paths with the very friendly receptionist who answered some of our questions and gladly took two doughnuts off our hands. We also met the Community Health Nurse who gave us some more details about the community and informed us that camp registration had already been advertised for Monday morning at 10:00 am. We were also able to use the phone in the Community Health Office to phone Frontier College to let them know that we had arrived. Our attempt to introduce ourselves to anyone from NAPS (Nishnawbe-Aski Police Service) was unsuccessful, so we dropped off our doughnuts at home and made a trip to the Northern Store to get some groceries. Just as we were starting to fill our basket, the power went off and we were forced to put everything back and walk back to our house feeling a little hungry (and more than a little sweaty)! After spending some time unpacking and getting settled in, our power came back on. To our surprise, we discovered that we have wireless internet in our house! It seems like the teachers living here only very recently moved out and we are not sure how long our internet access is going to last, but it is a nice perk for now. With the power back on, we thought we might have some luck heading back to the Northern Store for groceries, but it had closed early because of the power outages. Luckily, the Community Health Nurse who we had met earlier drove by with her husband and two daughters (one of them will be coming to camp with us this summer) and took pity on us. They drove us to a smaller store near the airport (we had no idea that this existed) so that we could at least get enough food to make ourselves some dinner. They also took us on a very nice tour of the community and showed us where they live in case we ever need anything. We have now spent most of the evening getting ourselves organized and settled in. Now, it is time for some much needed sleep! This entry was posted in Fort Albany and tagged First Nations, Fort Albany, Frontier College, Lieutenant Governor's Aboriginal Summer Reading Camp, Northern Ontario on June 27, 2014 by nicoledalessandro. Today was not nearly as long of a day as the past two days of training. This morning, a few of the teams (ours included) shared some of their day plans for camp. We also had a presentation about Duty to Report by a woman from Tikinagan Child and Family Services. It was a pretty straightforward presentation, but one comment really caught my attention. A lot of the questions that came up after the presentation seemed to be about how to recognize signs of abuse in children. It was easy to tell that the conversation was entering uncomfortable territory and one of the Northern counsellors finally jumped in with a reminder that we are not going into these communities to look for abuse. This may not seem like a profound comment, but it was for me. It is interesting (and troubling) to think about the way that we subconsciously internalize a lot of the information that is presented in the news about First Nations communities. Unfortunately, more often than not, this information is negative. This really reinforced the importance of going into this experience with an open mind and no expectation of what my summer will be like. I am going to Fort Albany to work with kids and support their literacy development. Beyond that, I want the experience to unfold however it does and I want to be open to learning as much as I can. Now, I realize that my selection of this quote may appear to be self-aggrandizing, but I can assure you that this is not what he meant. The Chief spoke a lot about the relationship between Canada and First Nations People (especially given the Supreme Court ruling that had come out of British Columbia earlier in the day) and made note of the fact that we are at a crucial point for determining what the future will look like for First Nations communities in Ontario. By establishing partnerships and empowering children, we have the ability to help improve the relationship between Canada and First Nations communities across the country. The afternoon consisted of one final presentation on behaviour management and then we were given our flight information. 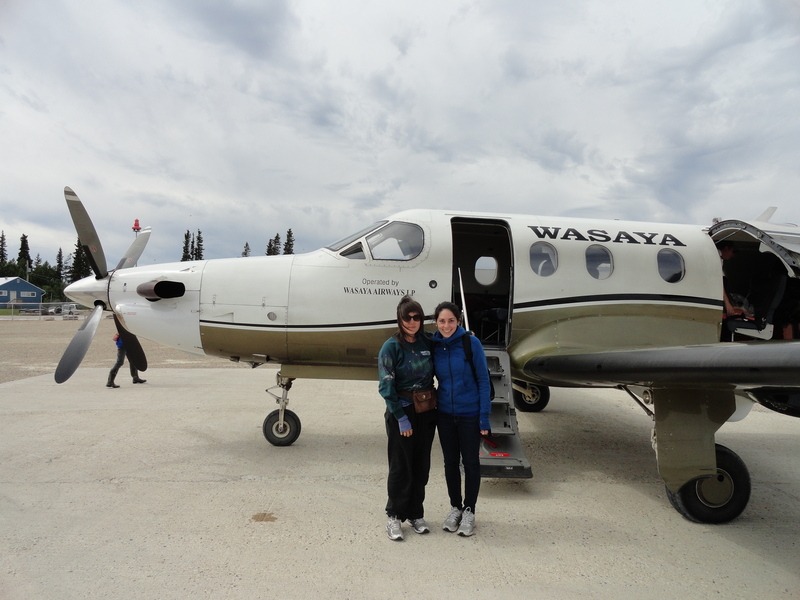 I will be on a chartered flight to the James Bay region along with the teams heading to Attawapiskat and Peawanuk (this will hopefully mean that it is okay for my luggage to be a little over the 35 pound weight limit). We will be leaving campus at 10am and considering that some other groups are leaving at 5:45am, I think we really lucked out! Now I just returned from sitting by the water on campus and watching the sunset. Most of the other groups are spending some time together tonight, but my teammate went out to meet a friend for the evening. I sat outside my residence for a little while but decided to go for a walk instead. To be honest, I have been enjoying the solitude tonight and it is so quiet and peaceful here that I just couldn’t waste the sunset. Goodnight Lakehead. Fort Albany, here I come! 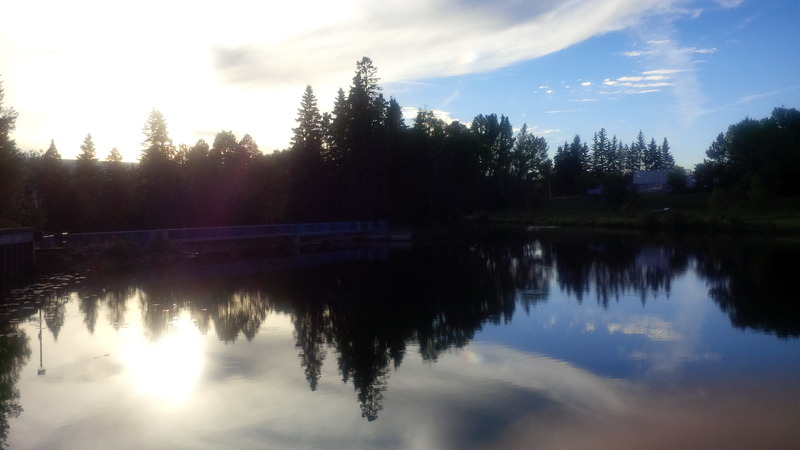 This entry was posted in Fort Albany and tagged First Nations, Fort Albany, Frontier College, Lieutenant Governor's Aboriginal Summer Reading Camp, Northern Ontario, Sunset on June 26, 2014 by nicoledalessandro. Today was our second day of training. It was another full day, but at least the weather was much nicer than yesterday! This morning, we reviewed our Reporting and Admin binders. This was a very helpful session because it gave us a much clearer picture of what we are responsible for and how the logistics of camp work. We also received resource binders that are filled with a lot of great ideas for camp activities that have proven successful in the past. Our morning training also included a presentation about some traditional First Nations teachings, beliefs, and ceremonies. This is one area that I know very little about and has been responsible for some of the nervousness that has accompanied my decision to head North for the summer, so I am glad that this was covered in some capacity. I know that we only scratched the surface of the topic and that these things will be different from one community to another, but I really appreciated a chance to learn more about traditional First Nations teachings. In the afternoon, we had a presentation by a representative from Right to Play. There are some communities in which they also run camps for Aboriginal youth and they have partnered with Frontier College to provide combined programming. Unfortunately, Fort Albany is not one of the communities that they are working in this summer, but it was still interesting to hear about how the two programs have worked together in the past. Our day of training ended with a presentation by the Early Literacy Lead from Mushkegowuk Council about literacy development and camp planning. We were given a chance to work in groups and use backwards design to develop some ideas for activities in different areas that we might want to implement at camp. It was exciting to actually think about different things that we can do with the camp program, especially because we have a lot of freedom to determine how things run throughout the summer. It was also great to hear some of the ideas that other groups came up with… I definitely took a lot of notes! After dinner, my teammate and I spent some time coming up with camp plans (we were asked to come up with three days worth of planning for homework to be presented tomorrow). We worked really well together and came up with a lot of different ideas. It is hard not to get too carried away with programming for camp before we have a chance to get to know the kids that we are working with. That being said, it is nice to know that we have a good supply of ideas to pull from as we go along. We also had a chance to chat with the woman from Mushkegowuk Council because she currently lives in Fort Albany. Since we do not have a Northern Counsellor to talk to, she gave us a ton of information about the community and answered a lot of our questions. She will be spending at least one week there during our camp program and promised to spend some time with us at camp. She also offered to bring up snacks or anything else that we might need from Moosonee when she comes – we might just have to take her up on that offer! 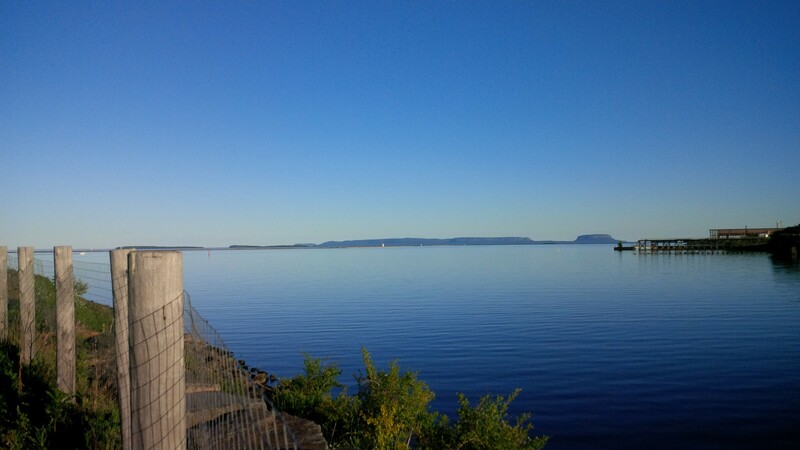 Once we finished planning for the evening, I went for a run by myself down to the waterfront. I figured that since I have never been to Thunder Bay before and am not quite sure when I will be here again (Frontier College used to host a debrief session in Thunder Bay at the end of the summer, but it sounds like that is not happening this year), I might as well take some time to explore. It was a gorgeous night, so after I ran down to the waterfront, I stopped for a little while to walk around and take some pictures. I took my time and ran back to campus by weaving my way through some different side streets to get a feel of what Thunder Bay is like. I made it back to Lakehead just in time to watch the sunset over campus. When I got back to the residences, a few of the other counsellors were sitting outside and doing some planning, so I sat with them for a while until the bugs finally drove us inside. Only two more sleeps until we fly out! 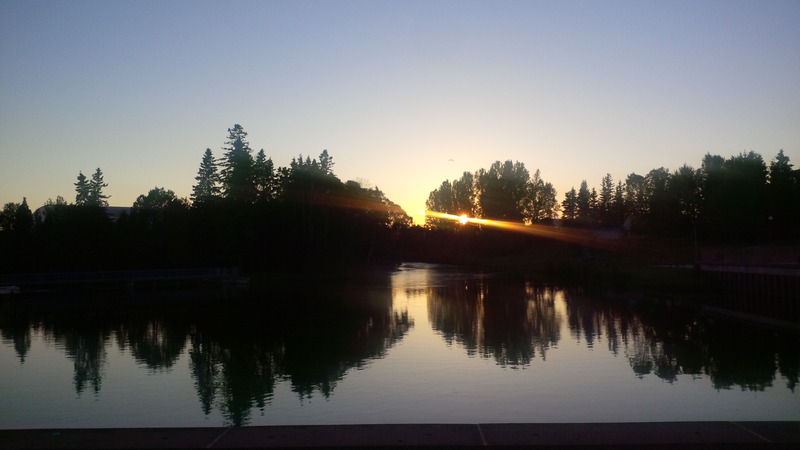 This entry was posted in Fort Albany and tagged First Nations, Fort Albany, Frontier College, Lieutenant Governor's Aboriginal Summer Reading Camp, Northern Ontario, Running, Sunset on June 25, 2014 by nicoledalessandro. Today we got started with our first day of training. It was a bit of a long day, especially considering that the weather was quite gloomy and we spent most of the day sitting in a dimly lit auditorium. That being said, it was nice to finally start learning more about our roles and responsibilities as camp counsellors and details of the communities that we will be living and working in. Our morning began with a welcome from an elder from a nearby community. We were then given an overview the camp program, which was interesting because I really do not know all that much about Frontier College or the origins of the Aboriginal Summer Reading Camp. While the program was started by former Lieutenant Governor James Bartleman in 2005, the current Lieutenant Governor, David Onley, has continued to support the program. However, as of this year, Frontier College has assumed stewardship of the program which means that they are responsible for funding of the project in its entirety. As a program that costs upward of one million dollars, that is no small undertaking. More information about supporting the program can be found here. We also learned about the scope and growth of the program. This year, camp will be running in 26 different communities (unfortunately two communities had to cancel last-minute because of issues in the community). The total number of camps being run varies from year to year. It began with a small pilot project of five camps and has grown to as high as around 40 camps a few years ago. The four-person team dedicated to running this program out of Thunder Bay are incredibly dedicated and it was great to hear them talk about the growth of the program. We also learned about some of the core values that are the foundation of all of the work that Frontier College does with the Aboriginal Summer Reading Camp program. Their main priority is establishing a partnership with each community that they work in. Camps operate in these communities because the community has invited Frontier College in to facilitate the program and in no way are these programs imposed on any community. This partnership is enhanced by the fact that Northern Counsellors from the various communities are actively recruited to work as part of the camp team in different communities. After learning a lot about the program itself, the rest of the day consisted of a variety of different training sessions. These include a question and answer session with returning counsellors, a presentation by a woman from One Laptop Per Child Canada (an initiative that aims to enhance education for Aboriginal youth through the use of technology), and a discussion about the importance of literacy and fostering a love of reading and writing in children from an early age. Along with this last topic came a discussion about unique ways to incorporate elements of natural literacy into the camp program rather than making camp seem like school for the kids. I am looking forward to being creative and finding fun ways of incorporating elements of literacy development into the camp program! After dinner, I decided to make a trip to pick up some other items that I realized might be useful since our last trip out yesterday afternoon. I thought that I had looked up a Shoppers Drug Mart close to campus, but I must have had my directions wrong because there was nothing there when I arrived. Instead, I ended up retracing my steps back to campus and then walking to one that we had gone to yesterday. The weather was not very cooperative with my adventure and I got rained on, but I suppose I should get used to dealing with the elements before the summer gets started. We also found out today that we do not have a Northern Counsellor joining us from Fort Albany, so there will just be two of us running camp there this summer. It would be nice to have someone from the community to help us learn more about the community and connect us with different resources throughout the summer, but we will just have to do our best to meet people and ask questions when we arrive. It will definitely be an adventure! This entry was posted in Fort Albany and tagged First Nations, Fort Albany, Frontier College, Lieutenant Governor's Aboriginal Summer Reading Camp, Northern Ontario on June 24, 2014 by nicoledalessandro. Considering that I am not much of a morning person, I was quite proud of how early I woke up this morning. I wanted to give myself enough time to get ready, eat breakfast, and make sure that I was not forgetting anything important (although I had closed my suitcase before bed and refused to let myself open it again because I knew that I would only end up stressing about whether or not to add or remove anything). After saying goodbye to my aunt, uncle, and cousins (I will probably miss my three-year-old sidekick the most), my parents and sister drove me downtown to catch the ferry. 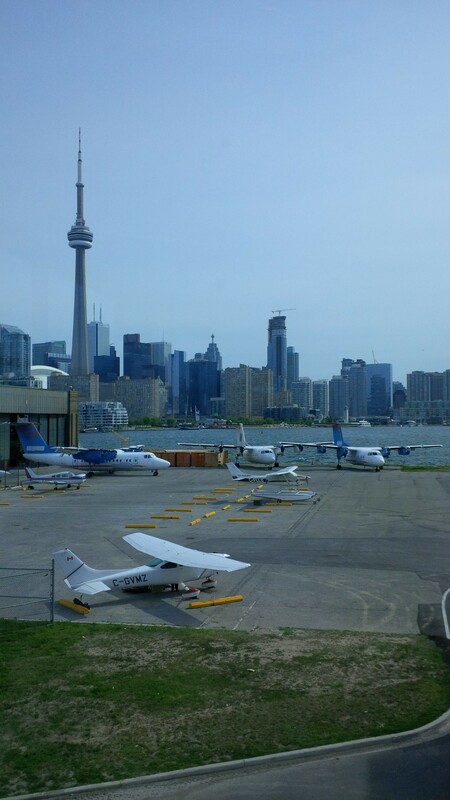 I had never flown out of the Toronto Island Airport before today, so this was a pretty exciting experience for me. The ferry ride was ridiculously short (it will be nice when they finish building the underwater walkway) and my experience at the airport was fantastic. It was nice to be away from the hustle and bustle of a major international airport. Plus, the free tea and snacks were a nice bonus too! I haven’t mentioned this yet, but today was the start of an eight week adventure for me in Northern Ontario. I will be working with Frontier College as a Camp Counsellor with the Lieutenant Governor’s Summer Aboriginal Reading Camp. 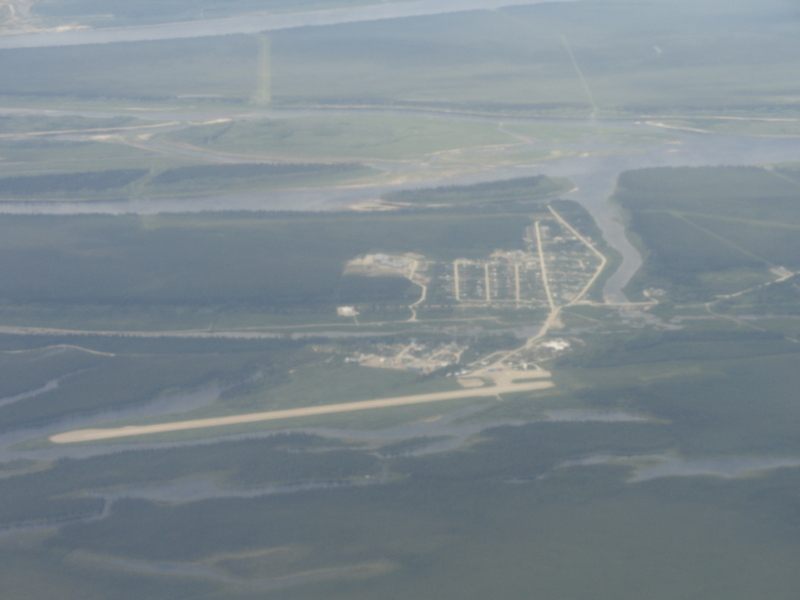 After a week of Training in Thunder Bay, I will be flying into the First Nations community of Fort Albany for a seven-week stay. This is an experience that I have been looking forward to for a very long time and, despite feeling a mix of nervous and excited, I am really looking forward to living and working in a new environment for the summer. I have no expectation about what the experience will be like, but I know that I am going to learn a lot. After some time by myself in the airport lounge (I somehow managed to spill my tea on at least three different occasions), I met up with my teammate and two other people who are also participating in the program. It was nice to finally chat with a group of people in the same situation as me and it was reassuring to hear that a lot of us shared the same feelings and had the same questions about the experience. Finally, we said our goodbyes to the Toronto skyline and boarded the plane! I sat beside another girl with Frontier College on the plane and the trip went by relatively quickly. Before I knew it, we were descending towards Thunder Bay. 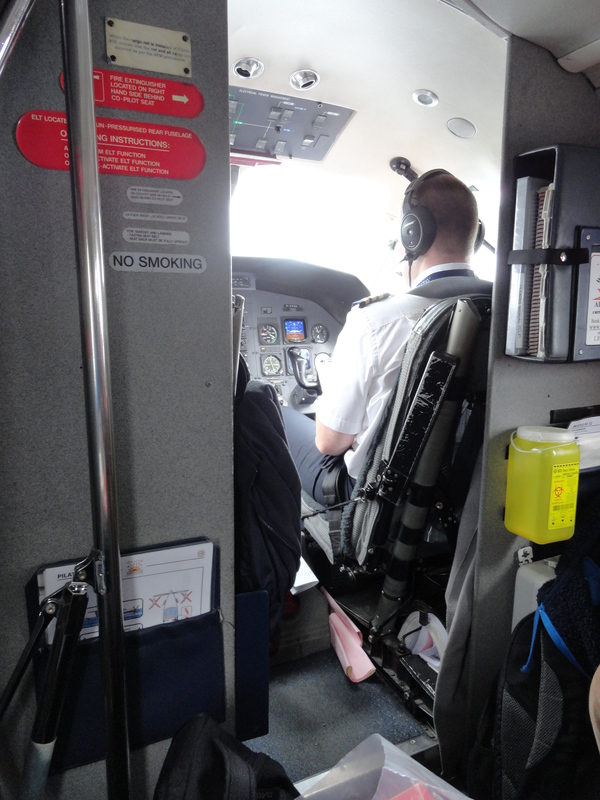 It is hard to describe feeling that I had when I l first looked out of the window as we were landing. In many ways, this was one moment when the reality of what I am doing really started to sink in. In that moment I also felt a strong sense of release and freedom. I have been craving adventure and space for a while now and I certainly hope to find these things (among many others) this summer. We were met at the airport by three Frontier College staff who helped us load our things into a truck and drove us to Lakehead University. It seems to be a nice campus and I hope to do some more exploring while I am here. We were assigned rooms in townhouse-style residences with other members of our teams (as of right now there are only two of us assigned to Fort Albany, but we are not entirely sure if others will be joining us). The five of us who had flown in on the same flight seemed to be the only ones who had arrived yet, so we did some exploring off-campus and got ourselves some lunch. We also made a few stops to pick up things that we had forgotten, including food that we had all been too worried about trying to pack but was beginning to seem pretty essential. By the time we returned to campus for dinner, most of the other counsellors had arrived. I had a chance to chat with a returning counsellor who worked in Fort Albany a few summers ago, which was really nice. Afterwards, we had the night to ourselves and I just spent some time meeting a few of the other counsellors and getting settled in. It has been a long day of travelling and I am looking forward to meeting everyone and getting started with training tomorrow morning! 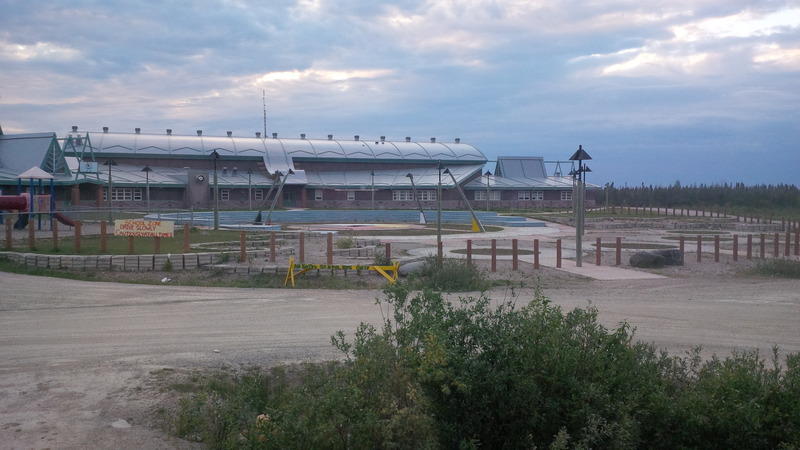 This entry was posted in Fort Albany and tagged First Nations, Fort Albany, Frontier College, Lieutenant Governor's Aboriginal Summer Reading Camp, Northern Ontario on June 23, 2014 by nicoledalessandro.